Nothing is as sweet as our Sugar Skulls! Patterned after traditional Mexican Dia de los Muertos (Day of the Dead) decorations, our Sugar Skulls can be found on Paper Source glassware, as masks, in our kits, and more! Today, we bring to you an easy, colorful Sugar Skull Tissue Pom Pom Garland project that will set your Halloween decor apart from all the rest! Fold a sheet of tissue into fourths length-wise and then into fourths width-wise. Cut squares of tissue measuring approximately 3 1/2″ x 3 1/2″. Create stacks of 10-12 squares of tissue. Gently fold the square in half making a small crease to locate the center of the square. Unfold and staple stack at center point using crease as a guide. Turn stack over and staple again, perpendicular to the first staple. Using scissors, cut off each of the four corners of stapled stack. Repeat steps to create desired number of pom poms. Thread needle with desired length of Baker’s Twine. Pierce needle through all layers of one tissue stack near the staple in the center of the bundle. To keep tissue pom pom from sliding on thread, bring the needle back through the center, over staple, securing pom pom in place. Continue threading tissue squares onto twine in the same manner. Gently crumple each stack of tissue to create texture and then separate each layer of tissue carefully, working from the outside towards the center. Fluff pom poms to schieve desired fullness. 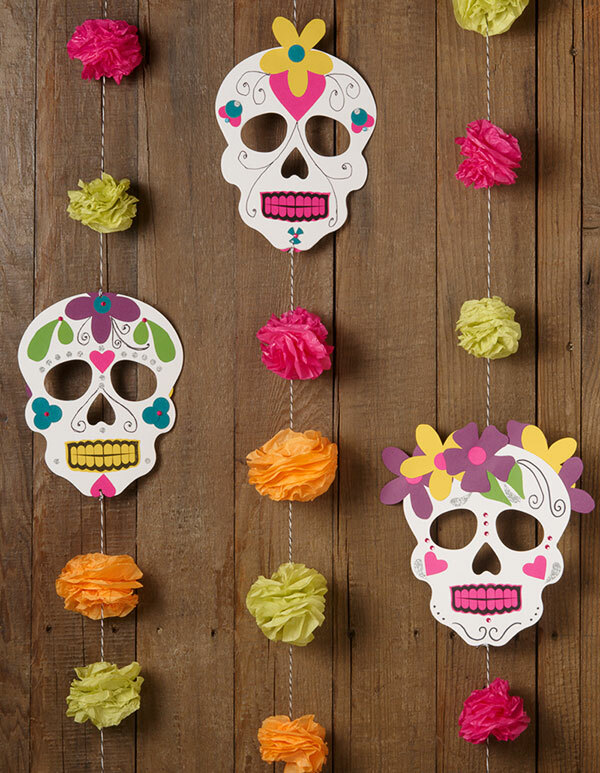 We added Sugar Skull Masks to the garland for Day of the Dead, but this easy garland can add color to any day! Where did you find the sugar skull mask kit? HI Maria, we have a new sugar skull kit this year! You can find it here: https://www.papersource.com/party/sugar-skull-garland-kit-10005167.html.